Prospex "Tuna" divers and a GMT. 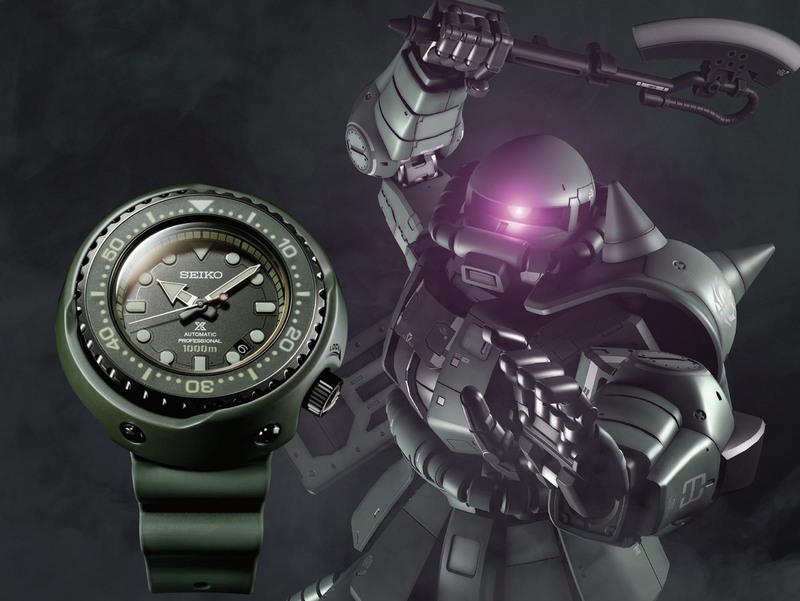 Seiko just revealed three Prospex limited edition watches to mark the 40th anniversary of the iconic Japanese anime series Gundam, which is all about a war waged in the 22nd century by giant manned robots known as “Mobile Suits”. 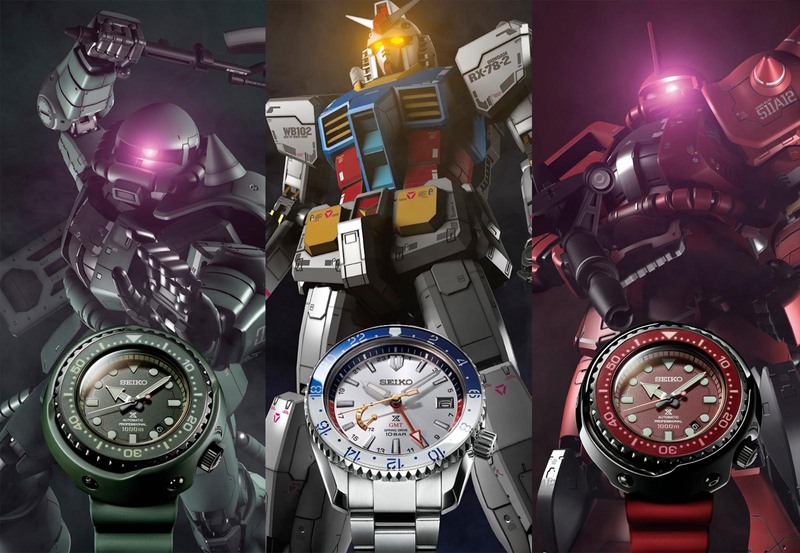 The commemorative series marks the first broadcast of Mobile Suit Gundam, and is made up of three watches, the Spring Drive GMT SBDB033J as well as a pair of 1000m “Tuna” dive watches, the SLA029J1 and SLA031J1. The three watches commemorate far more than a mere cartoon. In the decades since Mobile Suit Gundam aired for the first time on April 7, 1979, Gundam has become one of the most successful anime franchises in history, spawning dozens of spinoffs in television, film, toys and games. In some ways the Japanese equivalent of Star Wars, Gundam is a space opera that has become a pop culture phenomenon. In fact, despite being four decades old, Gundam generated some US$611m of revenue in 2018 for its owner Bandai Namco. The flagship watch of the series – the Prospex LX Spring Drive GMT Gundam Limited Edition SBDB033J – is dedicated to the instantly recognisable titular character of the series. The tricolour red, blue and yellow livery is modelled on the RX-78-2 Gundam robot manned by the hero Amuro Ray in Mobile Suit Gundam, who is a pilot for the Earth Federation. Rated to 100m, the watch has a titanium case that measures 44.8mm in diameter, with a white and blue ceramic bezel insert. 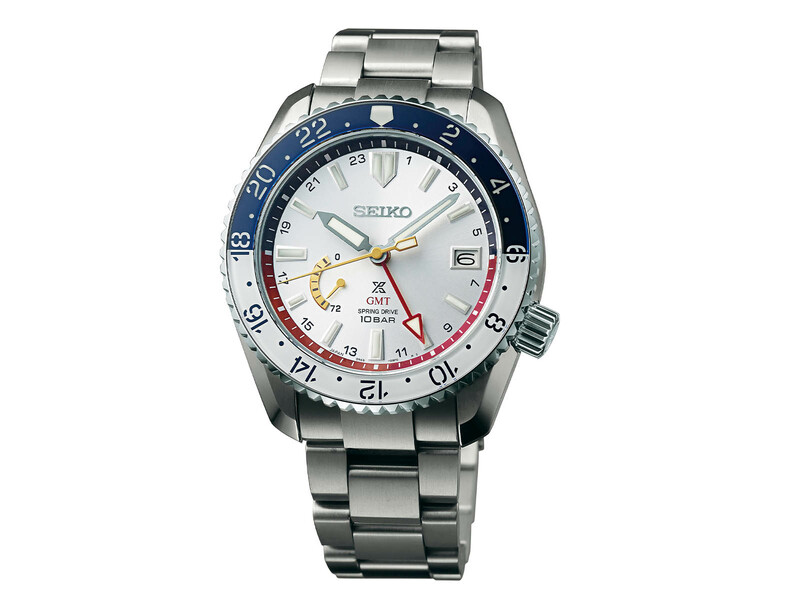 The twelve o’clock marker on the bezel was designed to resemble the robot suit’s head sensor unit. The watch also features the Earth Federation Force mark on the crown and case back, along with the “RX-78-2” engraved on the left case band. 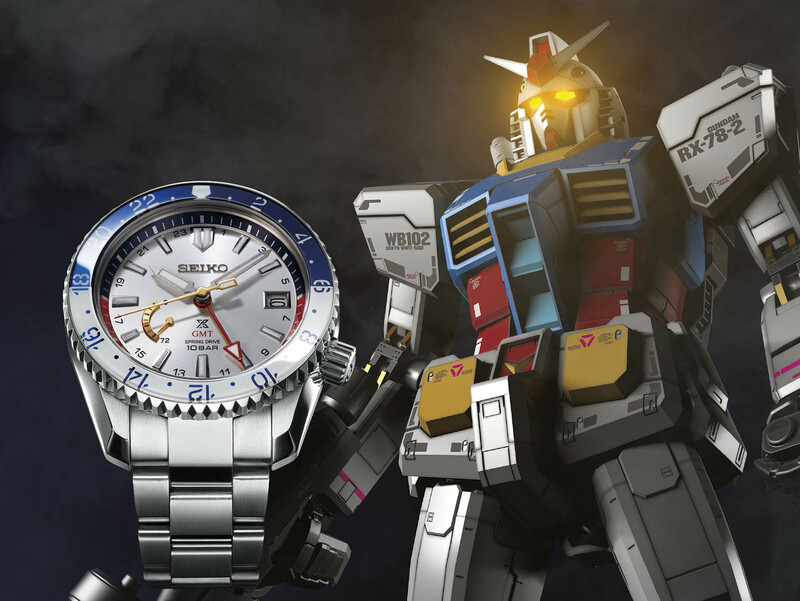 Limited to 300 pieces, the Gundam limited edition is powered by the Spring Drive GMT cal. 5R66 that has a 72-hour power reserve. The twin “Tuna” editions, each limited to 1000 pieces, are inspired by the one-eyed Zaku Mobile Suits used by the villains of the series, the Principality of Zeon. 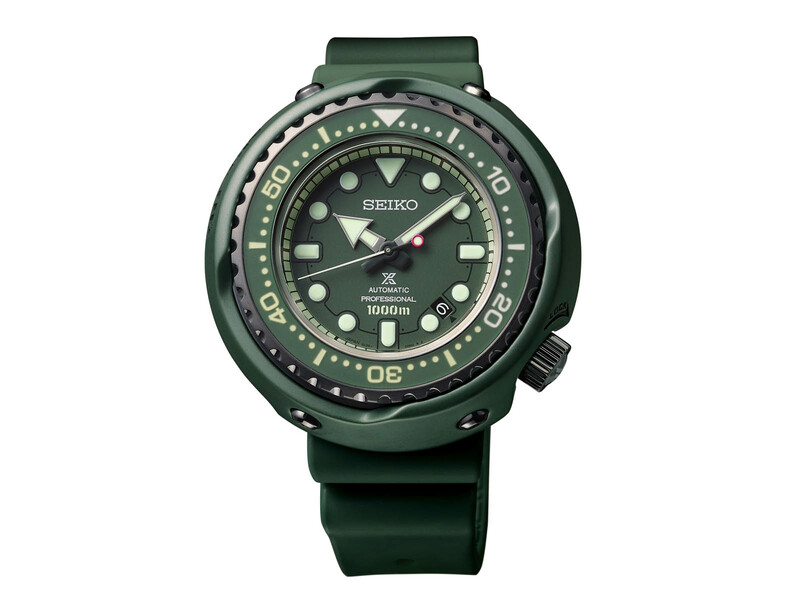 The Prospex Marinemaster Professional Zaku II Limited Edition SLA029J1 is a 1000m diver inspired by the military green colour of its namesake robot, and features a red counterweight on the seconds hand reminiscent of the Zaku II cyclops visor. The dial also features a chapter ring around the hour markers that is modelled on the “power pipe” of the Zaku II. The case is titanium, with a matte green ceramic shroud engraved with the Zaku II Mobile Suit number that measures 52.4mm in diameter and 17.2mm high. It’s powered by the automatic 8L35 movement that has a 50 hour power reserve. 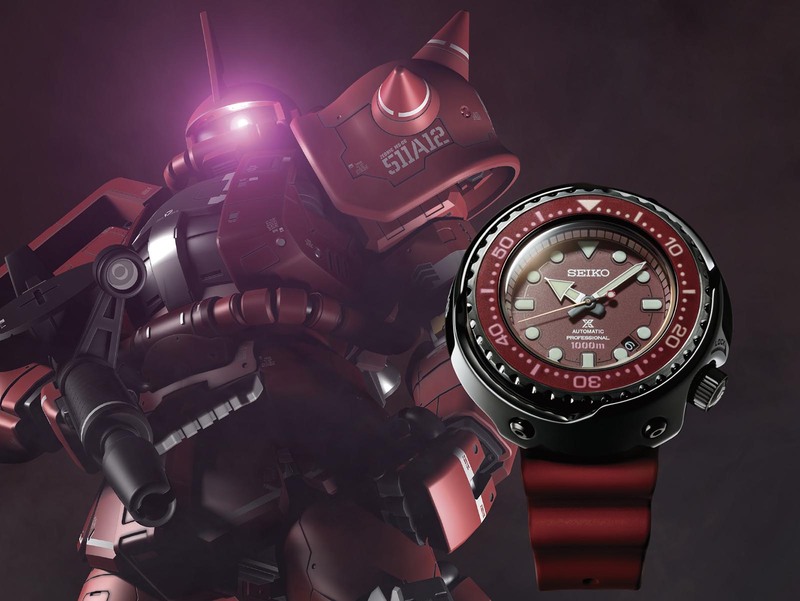 The final watch in the series is the Prospex Marinemaster Professional Char’s Zaku II SLA031J1, inspired by the Mobile Suit of Char Aznable, the principal antagonist and the Gundam equivalent of Darth Vader. 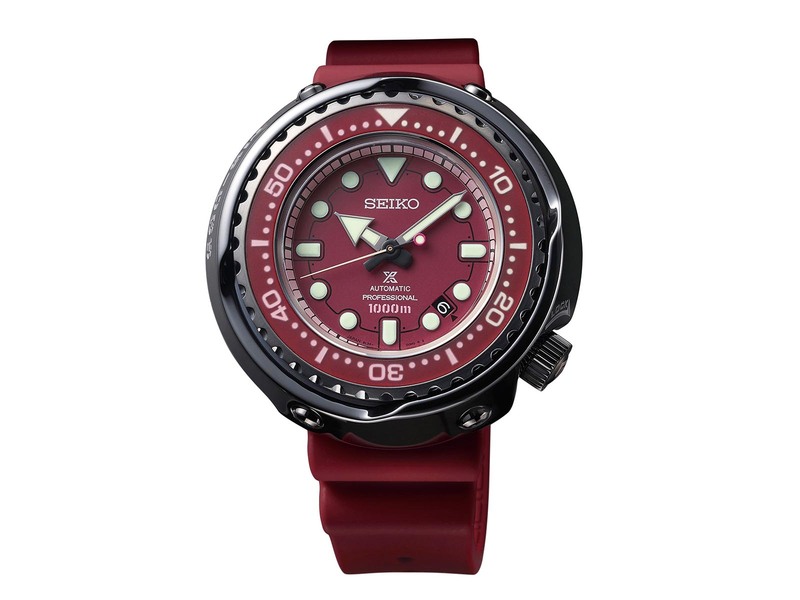 The watch features the same crimson colour scheme, with a black ceramic outer shroud. Besides the colour, the Char Aznable model is otherwise identical to the military green Zaku II edition. The Mobile Suit Gundam 40thAnniversary Gundam Limited Edition (SBDB033J) is limited to 300 pieces, priced at 630,000 Japanese yen excluding taxes. It will be available starting August 2019. The Mobile Suit Gundam 40thAnniversary Mass Production Type Zaku II Limited Edition (SLA029J1, or SBDX027 in Japan) and Char’s Zaku II Limited Edition (SLA031J1, or SBDX029 in Japan) are limited editions of 1000 pieces each, priced at 400,000 Japanese yen before taxes. Both will be available from April 2019.